Marriage: Married twice. His first wife died. Children: Daughters Armegot, Catherine, Christine, Else, Gunelle. Son Gustav. Died: May 3, 1663 in Sweden. Sweden was a powerful country in the early 1600’s. The government of Sweden decided to send some people to settle along the Delaware River. Peter Minuit had worked for a Dutch trading company. In 1637 he and a group of settlers sailed across the Atlantic on two ships. They arrived at the Minquas River in March 1638. Peter Minuit changed the name of the river to the Christina River. He bought land from five Native American chiefs. He built a fort where Wilmington, Delaware is today. He named it Fort Christina. Peter Minuit was the first governor of New Sweden. Peter Minuit died in a storm at sea. Sweden sent a new governor in 1640. His name was Peter Ridder. He was in charge until 1642. Then the Swedish government wanted a stronger governor. They chose Johan Printz. Johan Printz was born in Bottnaryd, Sweden in 1592. His father was a minister. The family wanted Johan to be a minister too. They sent him to school. They did not have enough money to finish his lessons. He left school at age 26. Johan Printz went into the Swedish army. He fought for the King, Gustavus Adolphus, in Poland. During the Thirty Years’ War, Johann was a Colonel. He was in charge of a group of horsemen. They were called the West Gotha Cavalry. He was a soldier for twenty years. He made a mistake at the Battle of Chemnitz. Because of this he was put out of the army. In 1642 Printz was chosen to be the new governor of New Sweden, in America. He was 50 years old. The Swedish government made him a knight. They gave him a list of Instructions. The list told him exactly what to do as the Governor. He was told to keep the peace with the Native Americans and with the settlers from other countries. On August 16, 1642 Johan Printz, his family, and some settlers left Stockholm, Sweden in two boats. They were the Fama [Fawn] and the Svanen [Swan]. They were afraid of hitting the sand banks near Newfoundland. The ships sailed south along the coast of Portugal. They crossed the Atlantic Ocean and arrived at the Island of Antigua. They spent Christmas there. Then they sailed north, through rain and snow. They arrived at Fort Christina on February 15, 1643. Johan Printz was a very big man. He weighed over 400 pounds. He was between six and seven feet tall. He had to ride a very strong horse. He had a lot of energy. Most of the time he was good at getting things done. Sometimes he acted too fast, and made quick decisions. Sometimes he acted very proud. The Native Americans called him “Big Tub." Governor Printz did not think that Fort Christina was in a good spot to control the river. He built some new forts, Fort Elfsborg, New Korsholm, and New Gottenburg. New Gottenberg was built on an island called Tinicum. Printz built his house on the same island. He called it Printz Hall. The inside rooms were made from wood brought from Sweden. The fireplaces and stoves were built of bricks brought from Sweden. Even the glass in the windows was from Sweden. The house had a library with 200 books in it. It had offices and a courtroom. On the land around the house were an orchard, a barn, and a storage house. Near the house a church was built. Fort Christina was repaired. A wharf was built by it. Ships and wooden items like buckets and tubs were made there. Johan Printz had a ship built just for his use. The settlers lived near the forts. They grew wheat, barley, and corn. They tried growing tobacco in 1644. It did not grow well. In 1643 there was not much food to eat. Many settlers were sick. In March of 1644 the Fama brought supplies from Sweden. There was food to eat. In 1645 the farmers grew good crops. Things were going well. On November 25, 1645, the watchman in the New Gottenberg fort fell asleep. He left his candle lit. A fire started. The fire reached the chest holding the gunpowder. The gunpowder exploded. The fort burned. So did Printz House and the church. The barn was the only building that did not burn. Only a few things were saved. It was so cold that the river had frozen. No one could come from the mainland to help the people on Tinicum Island. They were alone until March. It was a very hard time for them. In 1646 Printz House, the fort, and the church were built again. Governor Printz had a new watermill built on the riverbank. It ran a mill to grind wheat into flour. In October 1646 a ship called the Gyllene Haj [Golden Shark] came from Sweden. It brought a large cargo. The people had a day of thanksgiving. There were 183 people in the colony. The next ship from Sweden came in January 1648. The Svanen brought supplies and goods to trade with the Native Americans. After that, there were no more ships with supplies. The settlers were on their own. Governor Printz tried to be friendly with all of the different people living around his colony. He gave gifts to the Native Americans. He traded with them for animal skins. He bought land from them before he settled on it. The Dutch had a colony called New Netherland. They wanted to trade for the same animal skins that the Swedes wanted. At first, the governor of New Netherland was Governor Kieft. He and Johan Printz were friendly. Later, a new man became governor of New Netherlands. His name was Peter Stuyvesant. He was not as friendly. Peter Stuyvesant built a new fort on land that the Swedes had bought. It was called Fort Beversrede. Dutch settlers planted trees and built houses near the fort. The Swedish settlers took them down. Printz built a large house. It blocked Fort Beversrede from the river. In May of 1651 Peter Stuyvesant brought men and ships up the Delaware River. He came again in June. Governor Printz did not have the men to fight such a large force. Stuyvesant bought the land along the Delaware from the Native Americans. Johan Printz told him that the Swedish people had already bought that land. Stuyvesant did not listen to him. He built a new fort, Fort Casimir. Governor Printz knew that he could not control the river any more. He took his men out of most of the forts and gathered them all together. In 1652 there were heavy rains. The crops were ruined. No ship had come from Sweden in a long time. There were no goods to trade with the Native Americans. Some people became unhappy with the Swedish settlement, and left. In the fall 22 men gave a petition to Governor Printz. It listed all of their complaints. The Governor was very angry. He had the men arrested, and executed their leader. In Fall 1652 Johan Printz decided that he could not be the governor any longer. He said goodbye and went back to Sweden. He left behind a new governor. His name was Johan Papegoja. He was married to Johan Printz’s daughter Armegot. Johan Printz arrived in Sweden in 1654. He lived on an estate named Gunillaberg. It was close to where he had been born. In 1658 he became the Governor of Jonkoping County in Sweden. In the spring of 1663 Johan Printz was thrown from his horse. He was badly hurt. He died on May 3, 1663. He was 71 years old. Governor Printz Park is located at 2nd Street and Taylor Ave. It is in Essington, a section of Philadelphia. 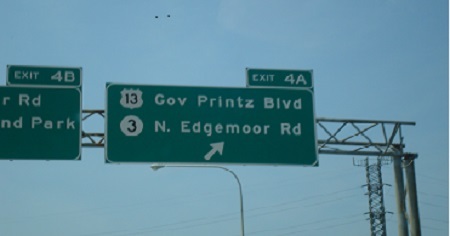 Route 13 in the state of Delaware is called Governor Printz Boulevard.